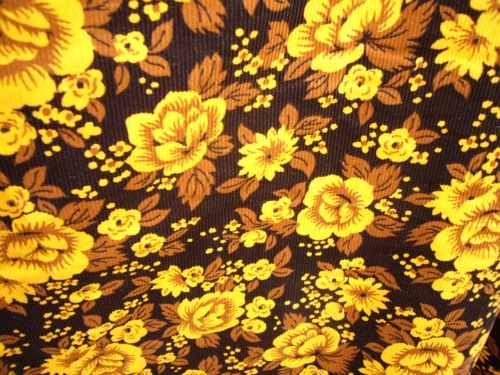 My 50s sheath made up in 70s lurid sulphur-yellow rose-printed corduroy that I warned you about in the previous post is finished and I’m delighted with it! Who knew that mashing up two such disparate decades would work?! Love it. So soft and cosy. And the fit is great – the only thing I’d change for next time (and I suspect there WILL be a next time) is to bring it in a bit at the top of the back seam where it’s a bit roomy because I have no shoulders. Otherwise, usual adjustments, blahdy blah, lengthened bodice, widened hips, same old same old. I would like to make special mention of lsaspacey for two reason. One, is her series on designers on the Colette Patterns blog is awesome. Secondly, she requested that I make the sassy neck detail (done) and talk about the instructions for this given my proclivity to charge ahead without reading them properly. Let’s have a close look at the neckline, eh? Right. Now the eagle-eyed among you will notice that the wee pointy bit does not line up with the raglan sleeve seam. It’s set back about, oh 1.5cm. How could this be? This is not in the pattern illustration! They lied, again! 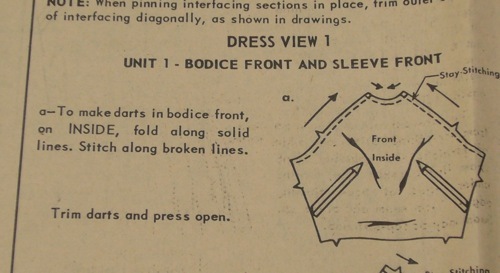 So we rabid fans for old stuff love to shakes our heads nostalgically and talk about how modern sewing patterns are made for the masses and fitting is a dead art, woe, lament, etc. 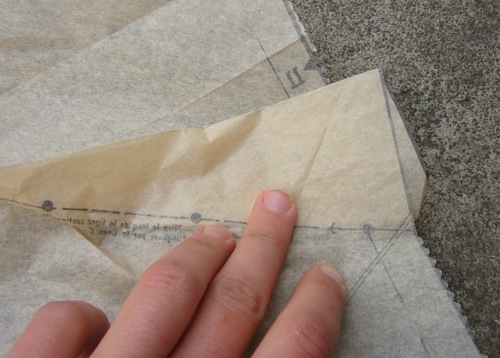 Old patterns were just so beautifully drafted, we say. Not always so. I’m going to show you a zinger of an error in a pattern I’m working on. It’s a small thing… but surely, because it’s a small thing, the fact that it’s wrong is more puzzling and infuriating. 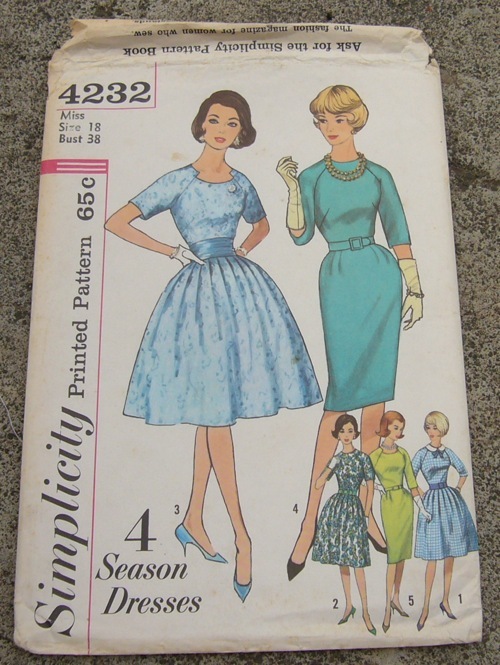 Here’s the offender – Simplicity 4232, a ‘4 Season Dress’ they say. Cute, eh? Raglan sleeves, French darts, sassy next detail. 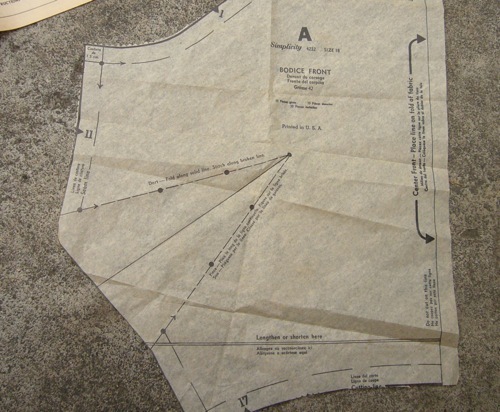 Here’s the pattern piece for the bodice. That’s quite a deep dart, non? That’s to be expected because it’s doing the work of both a bust dart and waist dart. Ambitious little thing. Sure to go far in this world. Oh my word, that’s even worse! Outrageous! You can imagine my indignation as I made up my muslin. Well, let’s see how Simplicity explains this disaster! 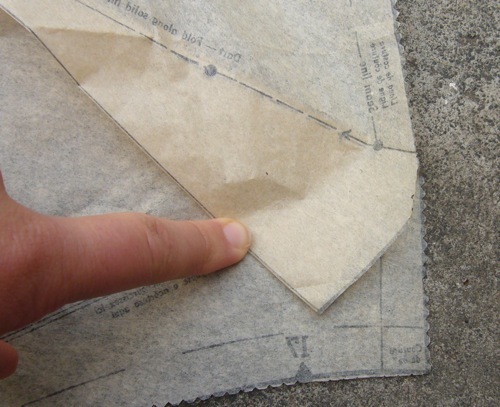 Get me a time machine so I can zip back to whenever this pattern was made so I can shake my fist at the Simplicity patternmakers! LOOK AT THAT! They don’t even DRAW DIAGRAMS accurately! Those bust darts are huge, how on earth are they little skinny slips of things now? TRIM darts and press open. My tip to you…. read every word of the instructions. Don’t just look at the pictures. Because old patterns were so beautifully drafted and they thought of everything. By the way, if you’re easy offended by anachronism and the colour pallette of the 1970s, look away now. 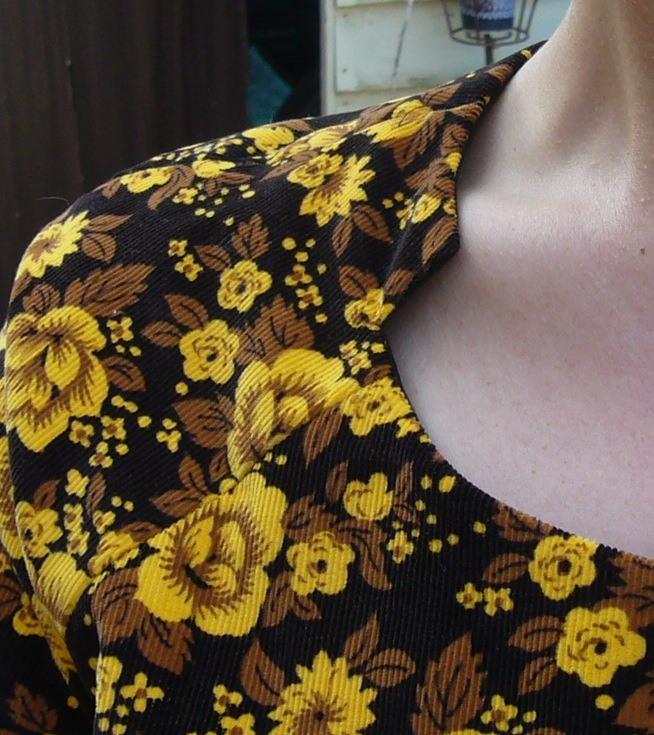 I’m making this dress (with trimmed, open darts) out of some printed corduroy that my sister in law gave me when her mum cleaned out her fabric stash. I love to think the her mum had plans for a suit, or maybe overalls for this. And believe me, that gold colour is even more radioactive in real life. So awful it’s good. I”ll be like a walking velvet painting and eyeballs will be insulted everywhere.